We've had a great response to our search for the best iPhone App, iPad App, Mac App and iOS/Mac Game with votes numbering in the thousands and people really excited about the huge giveaway that we ran alongside the vote. We've given away most of the codes but the final winners will be emailed over the next few days, so keep your eyes peeled for that. We've tallied the votes and figured out who you, our readers, have deemed as the best apps and games of iOS and Mac. The winners may be largely what is expected, but it is interesting to see who the runner-ups were - there are a few interesting results there. Just a quick note to all those who voted; thank you! We didn't know whether you would embrace this idea or not, and we're thrilled that so many of you voted and that we got such a large sample of our reader's opinions on the best apps and games of 2011. Jump the break to find out who all those winners and runner-ups all are. Tweetbot stole the show in the iPhone category, with a commanding lead from day one that it maintained until voting closed. It's clear that voters love the way Tweetbot works and looks - a sentiment that was probably boosted by the official Twitter app's redesign that occured just a few weeks ago. 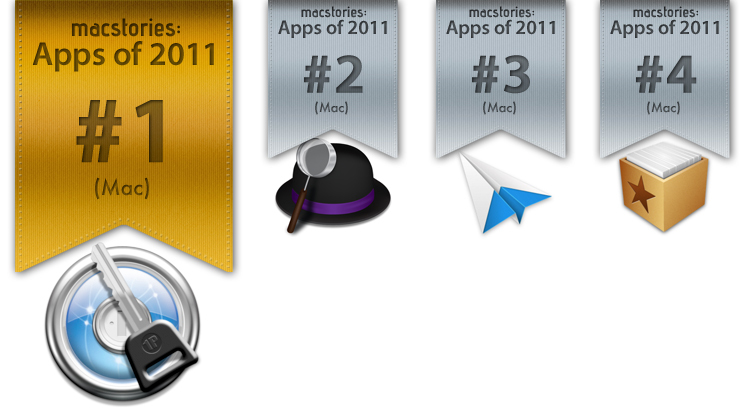 Congratulations to Tweetbot and the Tapbots team! Similar to Tweetbot in the iPhone category, Flipboard won the iPad category with a large lead. With a big update to the app this year, Flipboard can be said to be the app that really demonstrates what the iPad is capable of - a unique app that is beautiful, powerful, personal and most of all, useful. 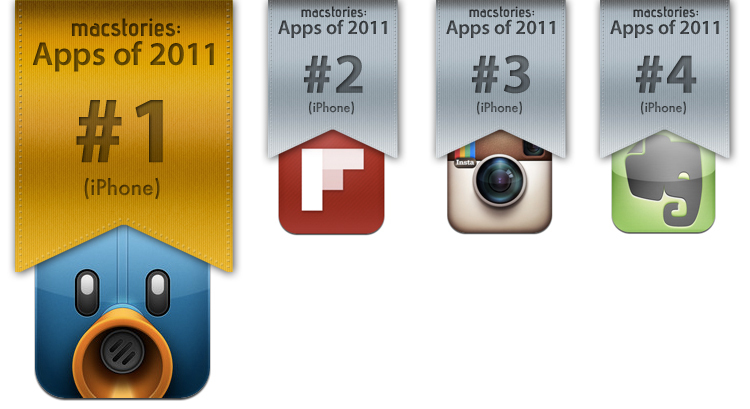 Congratulations to the Flipboard team! The Mac category was an unbelievably close race for the top spot between 1Password and Alfred. Swapping the first spot a few times throughout the voting period, the margin between them was always close. Nevertheless, 1Password edged out in front and has won the category. You, our readers, love the fact that with 1Password you can safely and easily save your passwords whilst also increasing the security of your logins because you can choose more complex passwords without that hassle of memorising them. 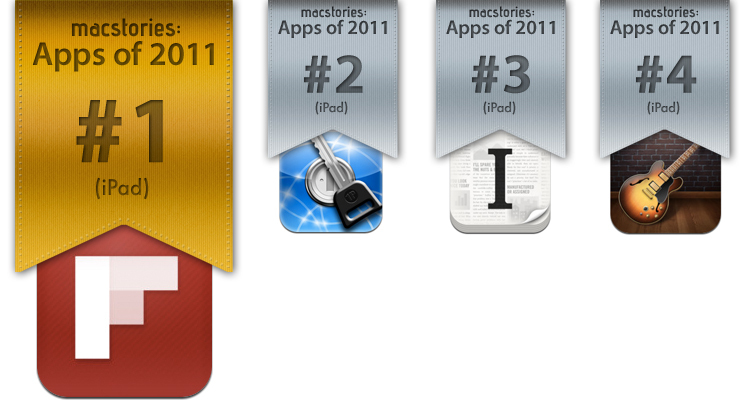 Congratulations to 1Password and the AgileBits team! Despite some early competition from the innovative Portal 2 game, Rovio's Angry Birds stole the show in the end, after slowly extending its lead after every day. With many updates to the game, including the big 2.0 update that dropped recently, launching on many more platforms and being downloaded hundreds of millions of times, Angry Birds has continued to dominate and has found many new fans who are now addicted to flinging those angry birds. 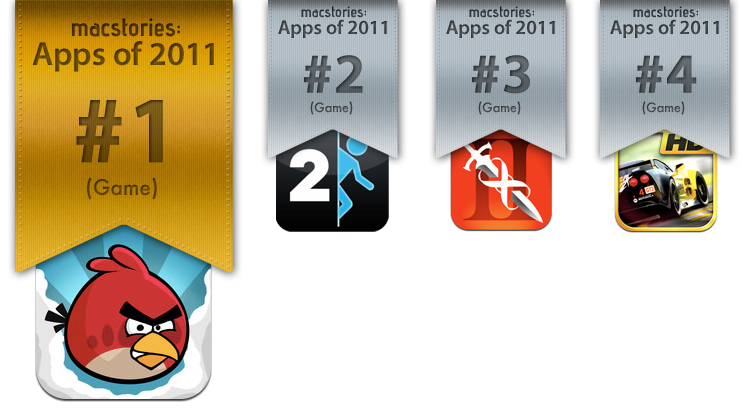 Congratulations to Angry Birds and the Rovio team! So those are the winners that you all chose! Thank you once again for helping us make this a great poll, and on behalf of the entire MacStories team, we wish you all a very Merry Christmas and holiday season.